Across Northern Ontario winter sports such as skiing, snowboarding and skating serve as favorite Canadian pass-times. For as much joy as these activities bring, they also bring snow and ice. Thankfully, our North Bay snow removal and salting can help you manage it. There is a thin line between necessary and excessive when it comes to Canadian winters. Who doesn’t want to see blanket of white on the ground through the holidays? shuffling through up to your knees is a different story. 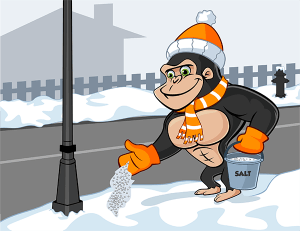 Our Gorillas want to help let your community enjoy their golden years without having to stress over snow removal. The area of North Bay has a high number of retirees, according to Statistics Canada. After so many years of shovelling, let us do it for you! Gorilla technicians are prepared to take on any challenge. We will do the heavy lifting on your home, business or strata property. Our Gorillas understand the importance of ice to Canadian communities, especially North Bay, who has given us one of our most popular winter activities, Ringette. We promise to leave the ice where it should be – on the rinks. With ongoing precipitation all year and an average yearly snowfall of nearly 23 feet, North Bay snow removal and salting takes care to expect the unexpected. How do we do this? With constant vigilance. Our Gorilla technicians monitor weather reports daily and nightly in order to be first on the scene where we are needed. The days of waking up to a mountain of snow covering your vehicle or sidewalk are gone with the help of our services.